Piano quality only possible from Yamaha The P-125 allows for incredible dynamics and expressiveness. The Pure CF Sound Engine includes the sound of the renowned Yamaha CFIIIS 9' concert grand piano. It is the result of over a century of acoustic piano craftsmanship combined with state-of-the-art technology and expertise. 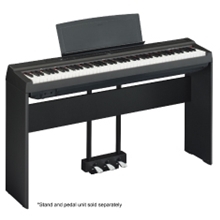 In addition, the Graded Hammer Standard (GHS) 88-key piano keyboard provides a heavier touch in the low end and lighter touch in the high end, so it can be played with the expressiveness of an acoustic piano.